Although it's not the end of the semester yet, I wanted to start documenting my Indian Epics "UnTextbook" course redesign so that I could share these materials as part of our #OpenTeachingOU chat about curation coming up on Friday, Oct. 30. For additional posts on this topic, including subsequent parts of this report, see the IndiaUnTextbook label. At the outset, I want to give a big thank you to Stacy Zemke and to Cody Taylor of the OER project in the OU Libraries for making all of this possible! 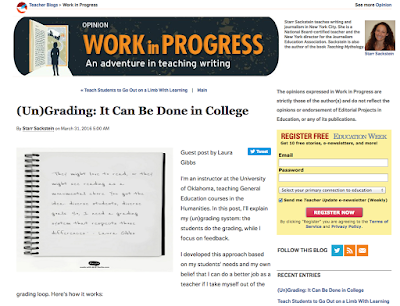 When I first started thinking about redesigning my course materials, I didn't even think of applying for an OER grant since I really didn't want a textbook (OER or otherwise). Stacy, however, urged me to apply for a grant to try an "UnTextbook" experiment, and with the funds from that grant, I was able to go in directions I never would have dreamed possible! For this post, I'll provide a timeline of major events. Summer 2014: I made an UnTextbook for my Myth-Folklore class (see the UnTextbook). 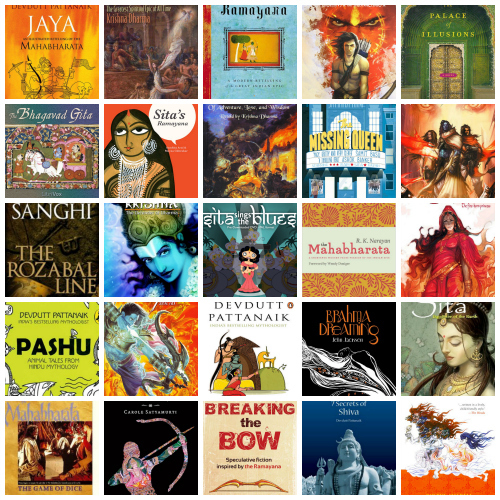 Fall 2014: I supplemented the books for Indian Epics with the India-related materials in the Myth-Folklore UnTextbook. December 2014: The moment of "Eureka!" when I realized I could do an UnTextbook for Indian Epics too. January 2015. I started cataloging public domain books to solicit student feedback in the Spring semester. April 2015. I saw the ACK comic books on sale ($399, free shipping) and bought a set for myself, and the Library also bought a set. You can see the unboxing in the Library! I started writing up ACK comic book guides in a new blog dedicated to the comic books; this process is ongoing. As of October 2015: There are 100 weeks of comic book reading available (13 weeks have detailed commentaries). May 2015. I started the Public Domain Edition of Ramayana, and we began the process of purchasing additional Library materials (print books, including graphic novels, ebooks, audiobooks, and one film). I also began cataloging the online and Library books and writing up Reading Guides; this process is ongoing. As of October 2015: There are 244 weeks of reading available (19 weeks have detailed commentaries). June 2015. I started the Public Domain Edition of the Mahabharata (finished in September), and I reorganized my Indian Epics Images blog and began adding new items. As of October 2015: There are 299 Ramayana images, 311 Mahabharata images, and 118 other images, for a total of 728 images. July 2015. I finished the PDE Ramayana and began adding audio with Soundcloud. I created a Diigo Library to help students in exploring and choosing what to read. I continued to catalog and write reading guides for the comic books and other reading materials. August 2015. I reorganized the course wiki to reflect the new content choices, and the Fall semester students successfully started the Ramayana portion of the class with no problems. Students chose between the Narayan book and the PDE Ramayana, and many students using the PDE Ramayana remarked on how much they liked having the audio! September 2015. I finished the PDE Marabharata and started adding audio (finished audio in October). Students successfully completed the Ramayana portion of the class and started the Mahabharata portion (Weeks 5-7). This was great: the Mahabharata is a much harder epic to read, but this new approach with students choosing from different reading options worked much better! October 2015. I continued to add new reading materials, while students completed the Mahabharata portion of the class and began the free reading (Weeks 9-14). Verdict so far: the experiment has gone even better than I expected overall! I would like to get more students to come to the Library to use the amazing materials there (so far I would guess fewer than half of the students have come to the Library to read there), but the students who are choosing instead to read public domain materials and/or to buy their own Kindle ebooks seem very happy with their choices. Click refresh page for a random comic book, and click on the title to see the blog post for the comic book that grabs your attention.